The teenagers made their decision out of ideological-nationalistic motives, against the backdrop of events at Al-Aqsa and Sha'ar HaRachamim. The Jerusalem District Prosecutor's Office filed an indictment on Sunday against two Arab teenagers, ages 15 and 17, for throwing Molotov cocktails at an Israeli police station on the Temple Mount. The teenagers are accused of using weapons for terrorist purposes, arson for terror purposes, acts of sabotage for terror purposes with aggravated intent, and an attempt to attack a policeman under aggravated circumstances for terror purposes. 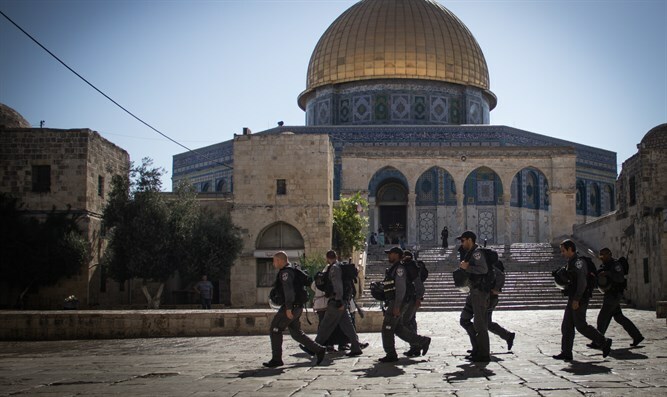 The indictment states that the teenagers, residents of east Jerusalem, decided two and a half weeks ago to carry out an act of terror against police forces on the Temple Mount by throwing Molotov cocktails and firing flares. The teenagers made their decision out of ideological-nationalistic motives, against the backdrop of events at Al-Aqsa and Sha'ar HaRachamim. According to the indictment, one of the teenagers approached the entrance to the police station at around 1:17 p.m., lit Molotov cocktails and threw them at the station from three feet away with the intent to set the police station on fire and injure the policemen. The Molotov cocktails hit the front desk of the station which caught on fire. When a policeman ran out, the teenager starting fleeing, simultaneously calling and signaling to his friend to throw flares at the policemen. His friend lit the flares and fired them at the policemen from about 50 feet away. The Prosecutor's office requested to detain the teenagers until the end of the legal proceedings against them.